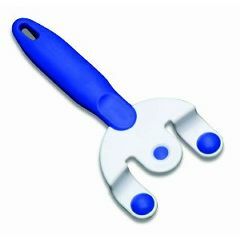 AllegroMedical.com presents The Cool Hand Hot Dish Holder. Everyone knows that plates get hot when heating food in the microwave. The combination of the heat and weight of the plate with food on it makes it a dangerous and tricky action which often can result is spillages and even dropping the plate. At last - heated plates can now be carried safely and securely directly from the microwave. The Buckingham Coolhand is a fantastic and innovative tool for anyone who uses a microwave in their kitchen. It is particularly useful for those with limited strength and/or dexterity in their wrists, hands or fingers when carrying plates. For use by anyone who regularly uses a microwave to cook or warm food on a plate. The Buckingham Coolhand is especially suited for those with arthritis, limited hand dexterity and impaired pincer grip of thumb and forefinger. The Buckingham Coolhand uses the power of leverage to lift plates so that the entire hand takes the weight and not just the fingers. The plate is gripped and released, as simply as using a hand - except using a Coolhand is safer and more practical. One size fits most plates.